Profit Maximizer System Review - It's a Trap! Profit Maximizer System Review – It’s a Trap! 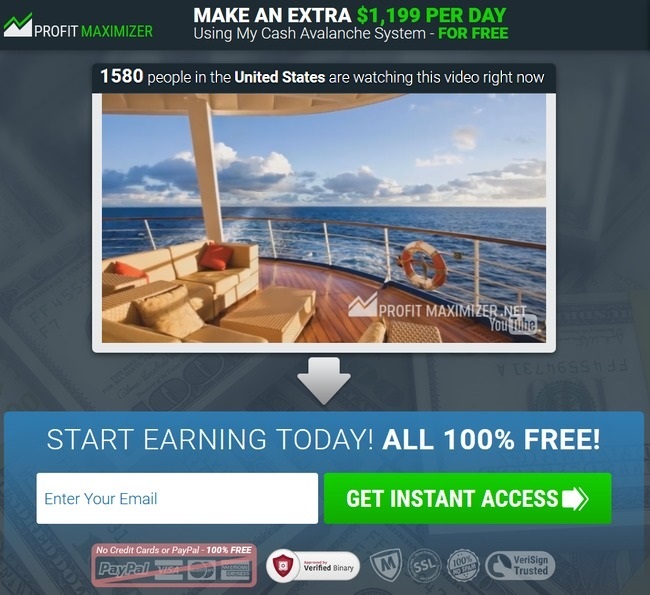 James Forley, the alleged owner of Profit Maximizer promises to make you an extra $1,199 per day with his 100% free Cash Avalanche System. Is it too good to be true? Is Profit Maximizer a scam? Let’s find out in our Profit Maximizer System Review. Trust me, Profit Maximizer System isn’t free at all. Profit Maximizer scam (yes, Profit Maximizer System is a scam) has its fair share of typical scammy red flags within its homepage. 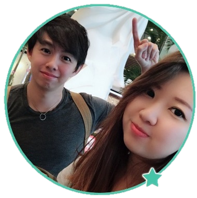 James Forley claims that his Profit Maximizer System is a 100% automated and free binary trading software that is guaranteed to make money for you. In the sales materials and members testimonials, every single one of them claims to have made at least $40,000 within the first month. Is there really a miracle system that makes money for you automatically? Unfortunately not. James is trying to convince you otherwise, because he can make money off you if you use his software. More on that later. Now let’s look at the red flags within Profit Maximizer System scam. Do you remember how you were introduced to Profit Maximizer System moments ago? Was it a curious email, a random pop-up, or an advertisement banner? And do you remember how James describe you as “one of the lucky internet users” who were selected for this great opportunity? He’s not telling the truth. The cold fact is, you weren’t selected to make money. Instead, you were selected to make money for someone else. If you sign up for Profit Maximizer System scam and choose to go for PRO account (refer to image above), you are going to make an affiliate very happy. Because you just made him a good $500 for falling into the scam. Not only that, I’m sure that you’ve noticed this little counter that indicates how many free copies of the software are left. This counter is a fake too. It’s a scarcity tactic used to force you into action. Anyone who is convinced by the lies and fake promises made by James in the sales video will be forced to take action when they notice there are not many free copies left. Scarcity tactic is very common widely used in internet scams, including Medallion App and Trendtrader scams which we’ve reviewed earlier. There are 2 ways to find out that the counter is fake. You can wait for a moment and notice how it will never reach zero. No matter how long you wait, there is always 1 copy available. Another method is to refresh the webpage. As you reload the page, you’ll realize that the number of available copies go back to the original count (26 for my case). It’s just a computer script that is set to countdown sporadically when the page loads. Next, you are required to provide your email address in order to gain access. Did you know that you can actually bypass the process? Try this link: profitmaximizer.co/members. It’s funny how James congratulates you for making it into the secret members area because you made it in the last minute. And notice how a fake countdown timer is used again to force its victims into action. The truth is, your email address wasn’t required to access the non-existent members’ area. It was collected just so they can send you more spammy emails afterwards. What about the filthy rich bank account shown by James in the sales video, and the raving testimonials given by its members? The amount in the bank account can easily be photoshopped, and the testimonials are bought at Fiverr.com for only $5. There are a lot of actors and actress selling fake testimonials on Fiverr as freelance job. They can read any scripts given by their clients like real testimonials. We do not condone or condemn the act of buying and selling testimonials, but I want you to be aware of this – that fake testimonials and sales videos can be easily bought online. The next time you come across sales videos with questionable claims and promises, be extra careful. Stay vigilant and don’t be fooled by Profit Maximizer System scam. Since this is a binary trading software scam, it’s essential for us to explain how binary trading works to make sure everyone is on the same page. If you already know how to trade binary options, you may skip ahead to the next segment. Binary trading is gaining popularity in recent years due to its simplicity. Unlike traditional investments like stocks and Forex, there is nothing much to analyze in binary options. You only guess if the price of an asset will rise or fall after a short period of time, usually between 30 seconds to minutes. There can only be 2 outcomes – either you are right, or you are wrong (hence the name binary options, or 2 options). This is how it works – let’s say I guess that the price of oil market will rise after 60 seconds, and I bet $50 on a 1-minute contract. When the time is up, and the price is indeed higher, I win a certain percentage of what I bet, usually between 60% to 80% (between $30 to $40). But if I’m wrong, I lose the entire $50 that I bet. In practice, trading binary options is not that different from gambling. Can you predict the outcome of a coin toss, and get it right consistently? The odds of guessing it right for every single toss is at 50-50. The same principle applies to binary options. There’s just no way to predict market movement in such a short period of time. Even if you manage a 50% win rate, you’ll still lose money due to the uneven winning vs losing payout of binary options. We do not recommend binary options if you want to generate serious income from the internet, simply because it’s one of the worst possible ways to make money online. There are better alternatives out there that are much more promising than trying to gamble your way to wealth. If you decide to sign up for Profit Maximizer System and use the Cash Avalanche software, you’ll have to open a binary trading account through their sales page (which is an affiliate link). The team behind Profit Maximizer System scam will earn a sum of referral fees as soon as you make your first deposit into the account. I was assigned to Ivory Option, and the minimum deposit is at $250. You may be assigned to different brokers depending on your country and location, but the minimum deposit for most brokers is $250. You have to register for a brand new broker account even if you already have an existing account with their designated broker, because the scammers behind Profit Maximizer scam cannot earn their referral fees if you don’t sign up through their affiliate link. Not only that, Profit Maximizer will continue to earn commissions off you over the long term. For every trade that the automated software makes for you, the team behind the scam will earn a trading commission, as long as you still have balance left in your account. Regardless of whether you make or lose money, the scammers behind Profit Maximizer System will make money off you. Is Profit Maximizer System a Scam? YES, PROFIT MAXIMIZER SYSTEM IS A SCAM. As we’ve said in the review earlier, we don’t recommend binary options trading as a way to make money online, at all. It’s basically the same as gambling, and using an automated trading software doesn’t make a difference. You are essentially putting your hopes and entire investment in a piece of software that gambles on your behalf.